In the year ending in March 2014, 1,288 unaccompanied migrant children applied for asylum in the United Kingdom. This was a significant decrease from a high point in 2002, when 6,200 of these children applied for asylum. However, at the same time actors have become more expert in identifying children who have been trafficked into the United Kingdom. In addition, the potential scale of the numbers of undocumented unaccompanied migrant children living in the United Kingdom has become a little clearer. This report has addressed the needs of all of these groups of children. 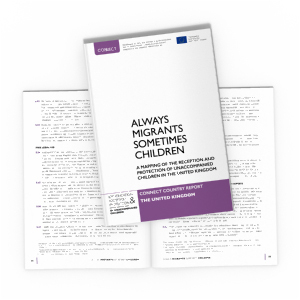 The CONNECT mapping surveys the general legal, policy and administrative context which addresses how actors engage with the situation of unaccompanied and separated children. This includes considering what bodies of law are applicable, and what national strategies or coordination mechanisms are in place. The mapping also identified the actors typically involved, their qualifications and specialised tools, and how they may cooperate each other. 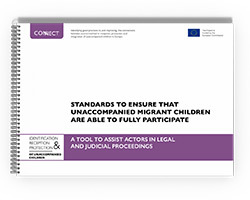 Given the focus of the project on better implementation of EU legal obligations, the mapping focuses on those actors who have formal roles, particularly those with statutory responsibilities towards and professional relationships with unaccompanied migrant children, rather than informal actors who may also play an important role in the lives of these children. It reviewed how actors respond to three priority issues, namely, (a) identifying and responding to situations of extra-vulnerability, including trafficking or trauma, (b) preventing and responding to disappearances of children from care, and (c) properly informing status protection procedures. The mapping explored notable aspects of the national situation through a desk study of existing literature and interviews with key stakeholders. The limited timeframe for the mapping and its relatively general scope means that the findings are illustrative of the national situation, rather than providing a comprehensive analysis. The goal of the mapping was to find opportunities and practical means for improvements across the region, highlighting how better to equip actors and help their work together. The research did not incorporate consultation with children. However the literature review did seek to examine what reports had addressed the views of children and, where possible, to identify how actors engage with children to get their views. The priority area of exploring information gathering processes also reviews how actors engage with children to understand their circumstances. In addition the CONNECT tools also seek in a variety of ways to contribute to the ability of actors to engage directly with children.